Both EnChroma and Oxy-Iso Color Correction Glasses work for about 80% of people with red-green colorblindness – which means that not everyone will have the same experience as those that appear in the videos. 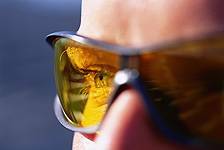 The lenses enhance color perception by filtering out the light into different spectral components. EnChroma has two versions – indoor, designed for looking at computer screens and outdoor, sunglasses.